What a winter this has been so far! We had a small snow storm just before Christmas and knew that we NEEDED to get our mudroom built. 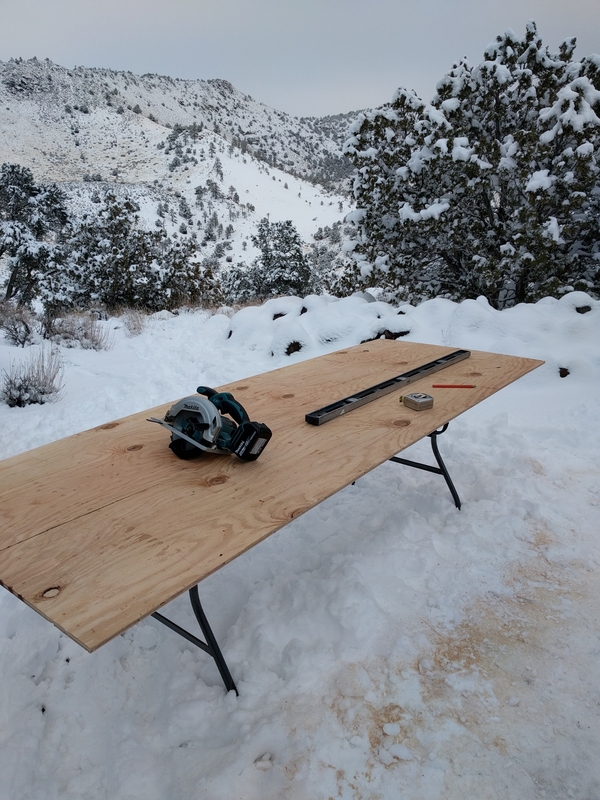 The day after Christmas, we started building it. 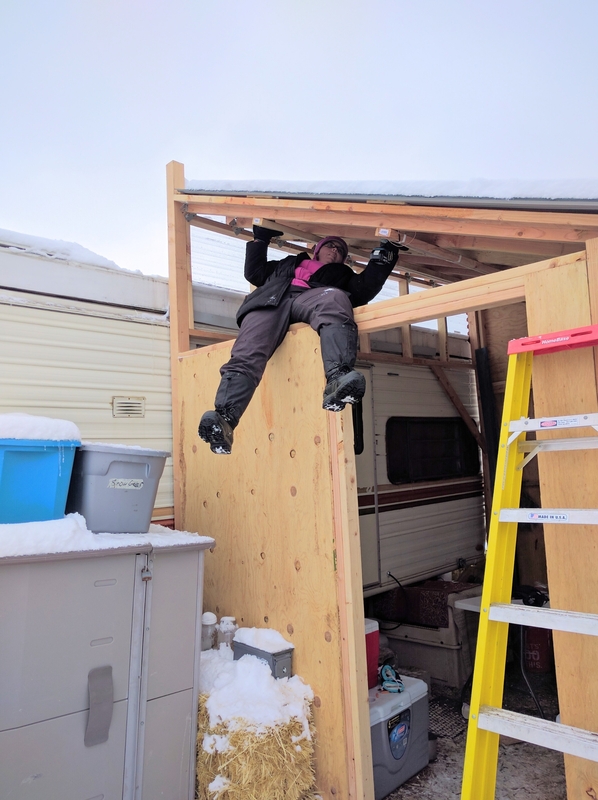 We got the roof on just before the next bigger snow on January 4th. And we’ve had back-to-back snow and rain systems since then. In fact, as I sit here typing this, it is pouring outside. We’re supposed to get about 15% of our yearly rainfall in this one storm. And we’ve already gotten over half in the last month alone. The bigger mountains around us have the most snow anyone living there has ever seen. What a blessing that mudroom has been. Since the push to get the roof on, we’ve slowly been finishing up as we have time and inclination. 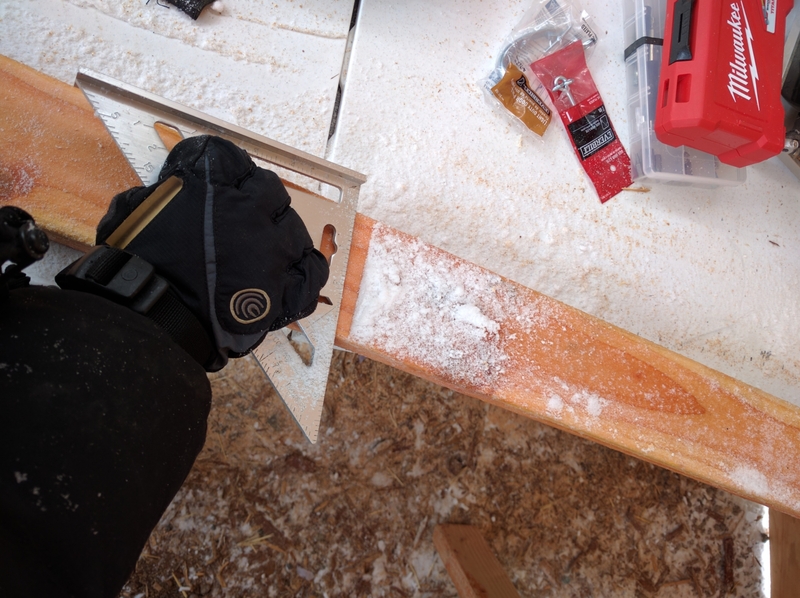 January 6 – enclosing the last bit of wall section. I always was a monkey. 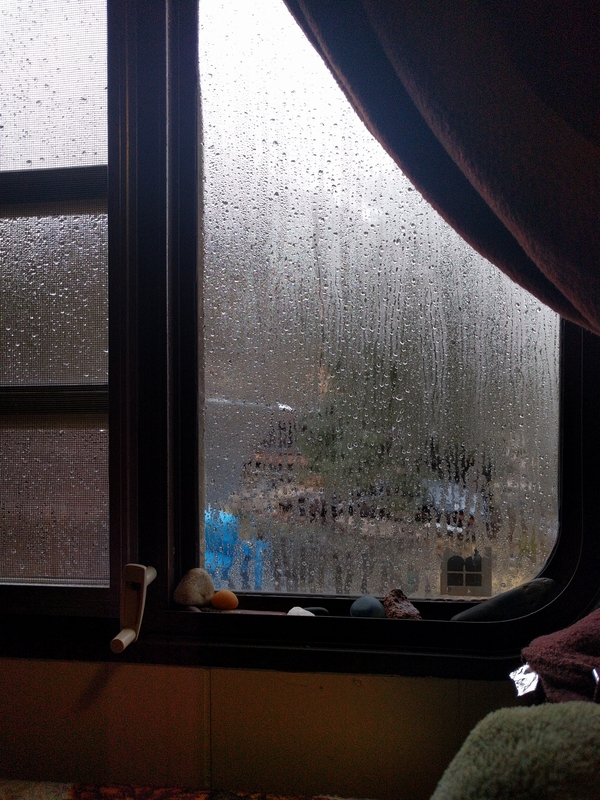 January 9 – the snow is gone, the rains have come. 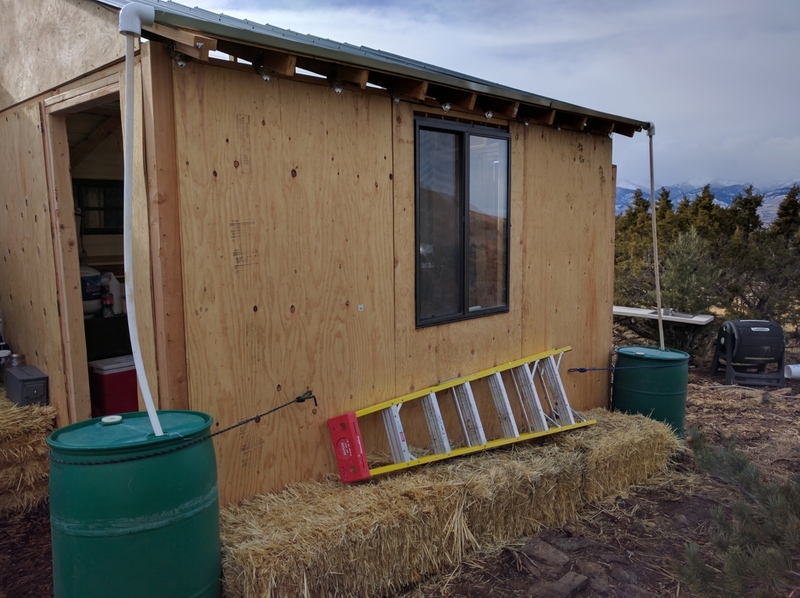 Time to add the gutter and rain barrels. January 13 – oh look, more snow. And the beginnings of a door for the mudroom. January 17 – mudroom floor before. At least when I was doing this project, the ground was mostly frozen, not the gushy quagmire it had been. January 17 – mudroom floor after. 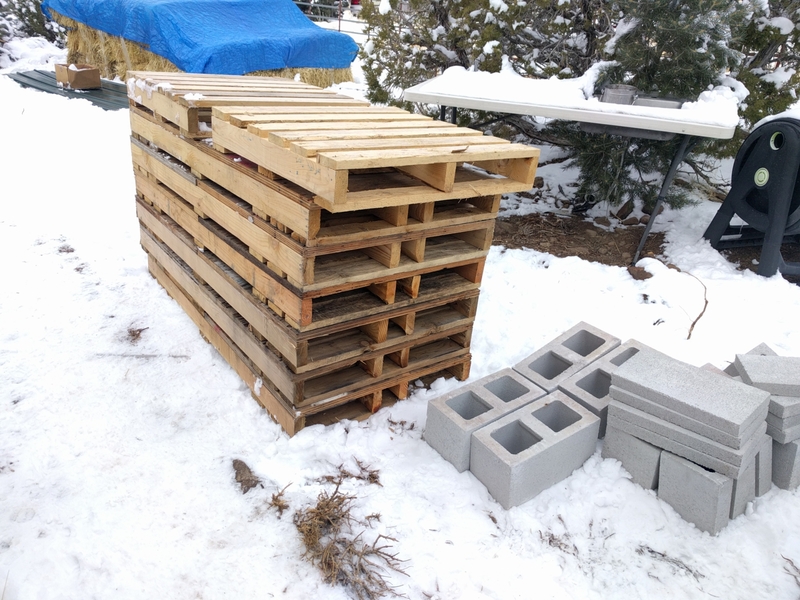 We used heavy duty shipping pallets we found on Craiglist. Once the floor was in, the mudroom was just about completed. It took us three weeks to build something that should have only taken one. But that’s construction in the winter for ya. 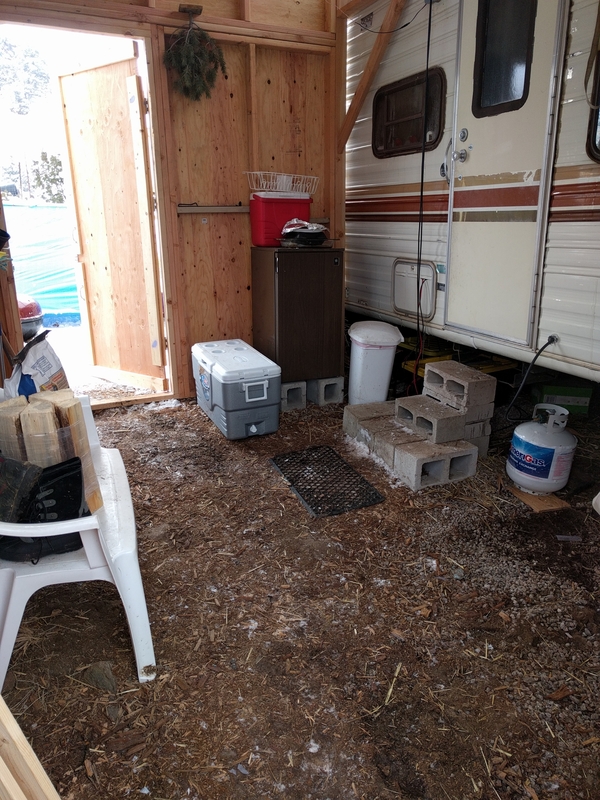 The Hubby is toying around with a small wood stove to put in there so that on days like today (rain, rain, rain), we have a place to dry things out if need be. 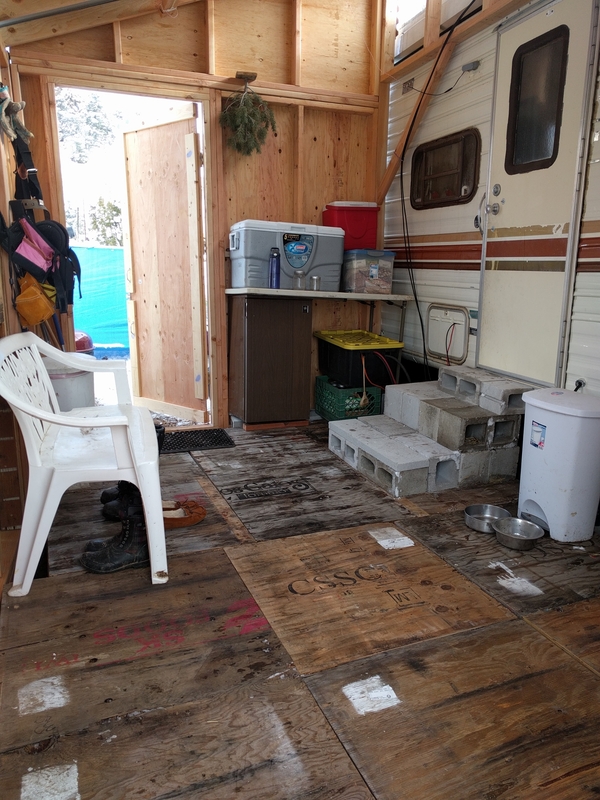 But even without a woodstove in there, it’s so very nice to have a place to kick off your wet and/or muddy shoes before coming in the trailer. It also keeps our fridge protected from the elements. January 23 – speaking of the elements…more snow! 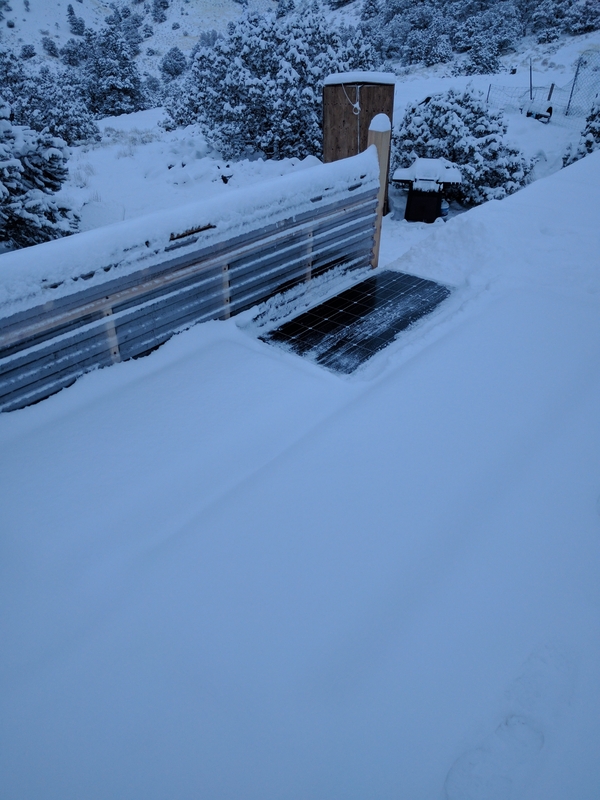 There are three more solar panels under there somewhere. We had a few days of warmer and drier weather over the past week and were able to get a few other projects done. January 30 – sunshine! 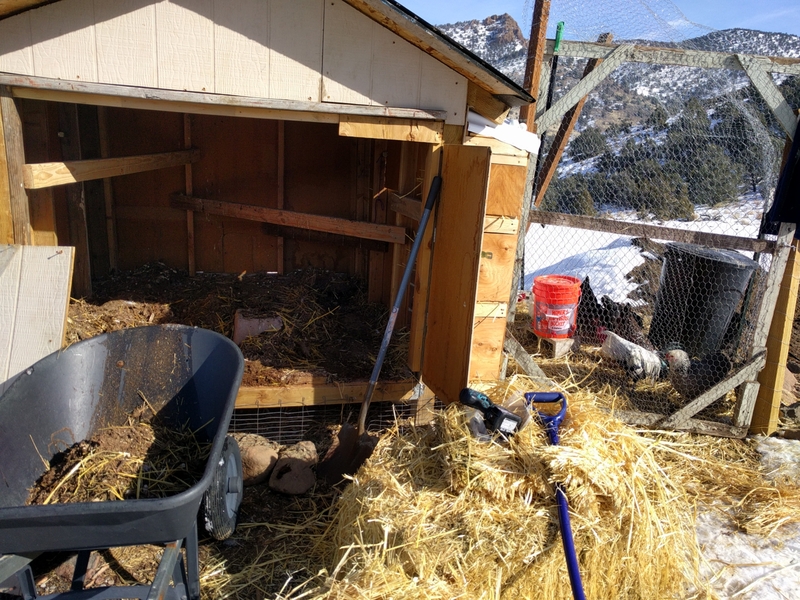 A beautiful day to clean out the chicken coop. 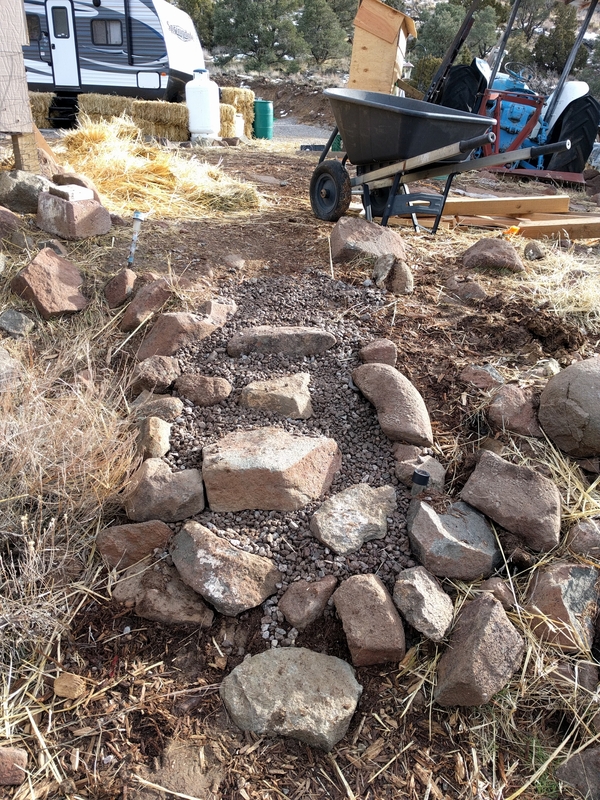 February 4 – more sunshine (but very windy) – finally built some steps into the hillside between Pajii’s trailer and ours. That will come in handy the next time it’s covered in snow. Slipping and sliding is fun when sledding, not so much when carrying dinner to your father-in-law’s house. 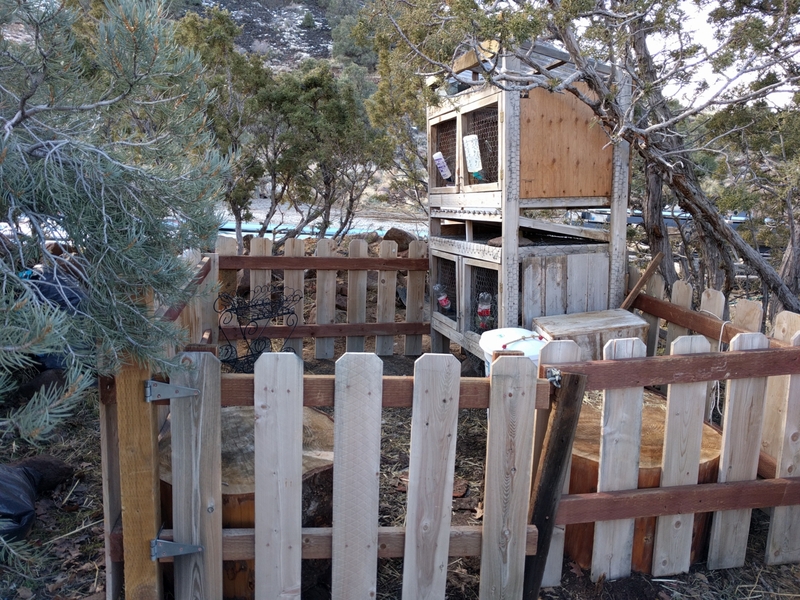 February 6 – despite the bone chilling wind (45mph), Princess Girl and I put up a fence around the rabbit hutch to keep the neighbor dogs out. Just glad it wasn’t raining like today. So, at the rate this winter is going, it’s looking like things won’t dry out till March or possibly April. Hopefully no longer than that. In the meantime, we are planning and dreaming and looking forward to the day we can start construction on our house. I hope you enjoy your day, no matter what the weather is where you are. 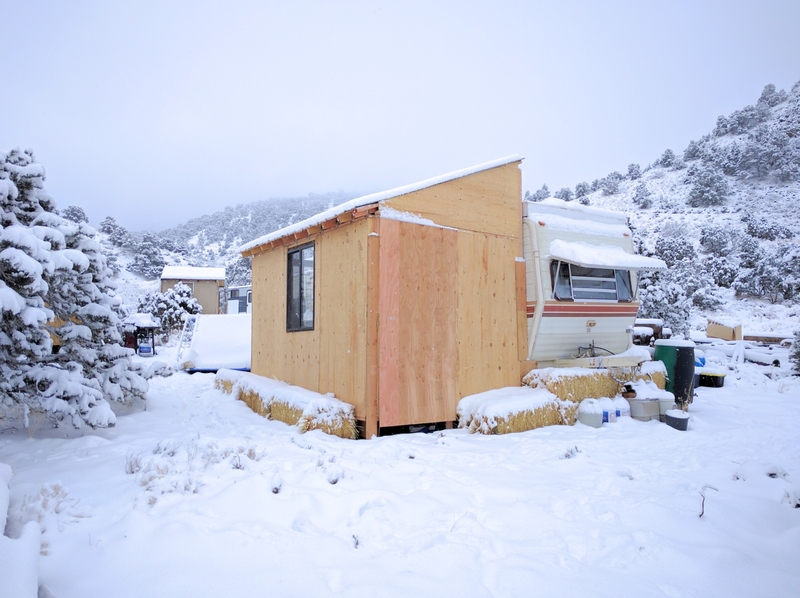 This entry was posted in Building a Home, Trailer Living and tagged Beginnings, Building, Construction, Homestead, Reuse, Seasons, Tiny Home, Trailer Living on February 7, 2017 by Maridy. Hello Maridy! Your mudroom looks great! Such a good idea, I wish I had thought of that. We have been inundated with snow and rain too, but keep telling ourselves that we need all this water to break the drought. I think we have enough. 😉 We are also hoping winter doesn’t last too long into spring, as our house plans are just about ready to go! Great job on building in the middle of winter. The view looks amazing too! Great job, building and finishing the mud room. It will possibly insulate the caravan as well?